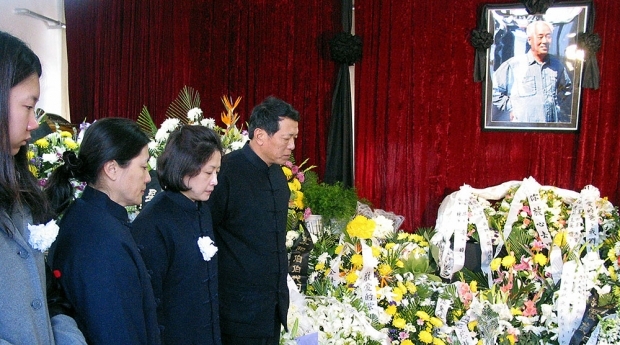 Family members of Zhao Ziyang, including his daughter Wang Yannan, second from left, stand in line for visitors to pay their last respects in Zhao’s former study, which was made into a makeshift memorial hall in Beijing, January 19, 2005. Zhao Ziyang, the premier and general secretary of the ruling Chinese Communist Party (CCP) in the 1980s, died on January 17, 2005. At a tightly controlled ceremony designed to avoid the kind of instability that the deaths of other controversial Chinese leaders had triggered, the CCP cremated his body and placed the ashes in an urn in his family home. It sat there for a decade as a bitter dispute dragged on between his family and the CCP about where his ashes should be buried. That dispute seems to be coming to an end: On April 5, Zhao’s family announced that it had finally received permission to bury Zhao’s ashes—though the final details about where and when are still unconfirmed. Why such a fuss over the ashes of a former leader? The main reason is that Zhao was purged in 1989 for allegedly seeking to “split the Party” by supporting the student protesters who gathered in Tiananmen Square in the months leading up to the massacre. When, in May 1989, he opposed the imposition of martial law, favored by the then paramount leader Deng Xiaoping, conservative Party leaders removed Zhao from his position and placed him under house arrest. The image that has defined Zhao—negatively, to China’s rulers, and positively, to some in China and the West—is the sight of him speaking into a megaphone to the students gathered in Tiananmen Square in May 1989. His voice trembling as he committed the equivalent of political suicide, Zhao begged the students to stop their hunger strike and promised them that they were the future of China. “We have come too late, and it is only right that you criticize us,” he said. It is an enormously moving moment to watch today, crystallizing the fact that the tragedy of June 4 might have been averted. But in remembering Zhao 10 years after his death and 25 years after Tiananmen, observers must not reduce him to this one noble act. After all, that’s what the CCP wants, in a sense: to reduce a man who led China through a period of extraordinary transformation down to a single event—one that the Party defines as a betrayal but that many others see as heroism—and to deny him a legacy outside of that. Zhao developed and implemented controversial market reforms through offices within leadership organs that he set up, gradually transforming China’s ossified system of state-set prices and increasing competitive pressure on powerful state-owned enterprises. He supported the bold thinking of China’s intellectuals, who only a decade earlier had been subjected to humiliation and violence during the Cultural Revolution, and he invited leading economists from around the world to come to China and offer advice. He developed a close working partnership with the World Bank and applied to join the General Agreement on Tariffs and Trade, the predecessor to the World Trade Organization, which China would join in 2001 under Premier Zhu Rongji. Once he became general secretary of the CCP in 1987, he pushed an ambitious coastal development strategy that sought to turn special economic zones on China’s coast into engines of the country’s growth through “beneficial” trade with the outside world—the strategy that would power China’s economic boom. Concurrently, Zhao began developing ambitious plans for political reform, aiming to make the Party less corrupt and more responsible in its governance. It’s impossible to know whether these political reforms would have worked, because Deng and other CCP elders cut his plans short. Despite his title, Zhao still took orders from Deng, who ruled China unofficially throughout the 1980s and 1990s. Deng provided high-level guidance, often in memorable aphorisms, and offered ultimate political support for Zhao’s innovative policies, but it was Zhao “rather than Deng who was the actual architect of reform,” according to Harvard University professor Roderick MacFarquhar. It is therefore especially notable that, in spite of Zhao’s indispensable contributions to the core of what China’s economy has become, Xi has not included him in this history. In the West, almost no one knows Zhao’s name, even after the 2009 release of a widely reviewed translation of the secret diary that he kept during his house arrest. Many of the policies that he designed and implemented are incorrectly attributed to Deng, who is a household name in the West—exactly the kind of hagiography of Deng that the Chinese leadership promotes as a means of shoring up its legitimacy. Google Trends shows that, over the past 12 months, “Deng Xiaoping” was searched for more than 49 times more frequently than “Zhao Ziyang.” Meanwhile, in the Chinese press, Zhao’s name is mentioned so rarely that it makes international headlines when this taboo is broken. Unlike his fellow reformer, Hu Yaobang, who was purged in 1986 and rehabilitated in 2005, Zhao has not been posthumously rehabilitated. Now that Zhao will, at last, be buried, it’s time to remember the full range of his achievements—and ensure that our impressions of China’s economic reforms aren’t determined exclusively by the official version of history peddled by China’s rulers. It’s impossible to write openly about Zhao and give him his due in China at present, so those of us outside China have a duty to keep Zhao’s memory alive.